“If only he would ______________” We keep a running list in our heads right? If only they could get their act together, our marriage would be great. We all wonder how to get our husband to help us? But you can’t force anyone to do anything. 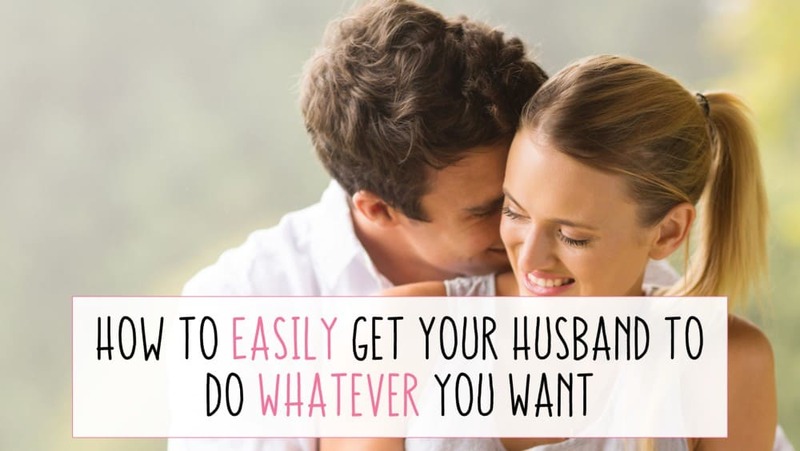 However, with what you’ll read below, you can get your husband to do whatever you want…without force. You may be surprised, but we, as wives, have a lot of power over what happens in our homes. It’s been said that the woman sets the tone and the mood for their household and I’ve definitely found that to be true in my house. So knowing this, it should be easy to understand that we have some other superpowers that maybe we aren’t tapping into. If you came to this little corner of the web to find a magic spell for your husband’s help or some other crazy “snap your fingers and make him listen” method, I’m sorry but that’s not the answer. I’m not telling you that you’re doing the wrong things, or that you’re the problem. I’m telling you that you are the solution to how to get your husband to help. We don’t have to play evil games or do crazy outlandish things to get our husband’s to get up and do things. We just need to use a couple tools that we all have hidden inside us. And side note- this doesn’t excuse your husband’s behavior and it shouldn’t give the expectation that we are responsible for their actions. But that doesn’t mean we can’t try to help. What does your husband do well? It could be something huge like building houses or saving people from fires. Or it could be something small but significant to you- like locking all the doors and windows before you go to sleep. If you have bitterness and resentment towards your husband and can’t think of anything- try to brush that to side. Take some time to pay attention to him. Watch what he does. Even if it’s just the smallest amount of effort put into something- take note of it. When you are harboring unforgiveness for someone or have bitterness against them, praying for them is the quickest path to forgiveness. Begin to pray for your husband. Ask God to help heal your relationship and bring back or renew the motivation that used to exist. It is easy to get complacent in marriage. If you feel like your marriage needs a revival, make sure to check out my free 5-Day Marriage Revival Course. We hold so much power with our words. When we recognize our husband’s for what they do well, it motivates them to do more. If you are not used to doing this, that is ok, practice makes perfect. It may seem awkward at first and unnatural. But so did walking and talking when you were a child and you still had to learn how to do it. If you are married, you chose to love your husband. And love is sacrifice. Sometimes that sacrifice means becoming uncomfortable doing things for our spouse that we don’t want to do. If speaking these things is especially hard for you at first, feel free to text him. But start somewhere. Be specific with what he did. Whatever you began to notice in step 1, this is what you would thank your husband for. There are many great ways here to uplift your husband. I am also a firm believer it starts with us and that we can do many things to build our husbands and marriages up. Great tips! This is on point my sista! Pinned to share with our Living Our Priorities community. I totally get that Melissa! Lol!